"Management Solutions for Leachate Biogeochemical Clogging"
"Detection of Nuisance Odors Using Odor Binding Protein Sensor"
"Development of a Biosensor for Measuring Odorants in the Ambient Air Near Solid Waste Management Facilities"
"Investigation of Electrochemical Oxidation for Treatment of Landfill Leachate"
"Beneficial Reuse Solutions for Landfill Operations and Management"
"Investigation of Effective Odor Control Strategies"
"Safe Discharge of Landfill Leachate to the Environment"
"Critical Examination of Leachate Collection Systems Clogging at SWA Disposal Facilities"
"Sustainable Management of Pollutants Underneath Landfills"
"Onsite Treatment of Leachate Using Energized Processes"
"Management of Subsurface Reductive Dissolution Underneath Landfills"
"Energized Processes for On-Site Management of Leachate"
"Interactive Decision Support Tool for Leachate Management"
"Investigation of Energized Options for Management of Leachate"
"Photochemical Iron-Mediated Aeration Treatment of Landfill Leachate"
"Preliminary Investigation of TiO2-Magnetite Photocatalysis"
The Bill Hinkley Center for Solid and Hazardous Waste Management funded a followup study to the Lab.EES work on leachate clogging control technologies and understanding of leachate clogging mechanisms. In 2017, the Environmental Research and Education Foundation funded FAU Lab.EES to investigate a novel biosensor technology that has the potential to objectively and rapidly measure odor concentrations in real-time, transforming how nuisance odors are monitored and regulated. The Bill Hinkley Center for Solid and Hazardous Waste Management also funded a follow up study in 2017 to find ways to improve odor detection including development of a novel technology that uses human odor binding proteins to quantify odors in a project entitled, "Development of a Biosensor for Measuring Odorants in the Ambient Air Near Solid Waste Management Facilities." In 2017, the Bill Hinkley Center for Solid and Hazardous Waste Management and FAU Lab.EES teamed up to test electrochemical oxidation for treating leachate from landfills. In 2016, the Bill Hinkley Center for Solid and Hazardous Waste Management funded FAU Lab.EES to investigate organic waste diversion to anaerobic digestion and its impact on landfill gas recovery and landfill economics. In 2015, the Bill Hinkley Center for Solid and Hazardous Waste Management and FAU Lab.EES teamed up to find ways to improve and standardize odor identification, evaluate additional methods to establish reasonable, objective standards for odor severity, and explore other options for mitigation and detection including a novel technology that uses human odor binding proteins to quantify odors. "CRITICAL EXAMINATION OF LEACHATE COLLECTION SYSTEM CLOGGING AT SWA DISPOSAL FACILITIES"
In 2012, the Solid Waste Authority of Palm Beach County, the Bill Hinkley Center for Solid and Hazardous Waste Management, University of Florida and FAU Lab.EES teamed up to conduct research on mechanisms and prevention of leachate collection system clogging. In 2012, the Bill Hinkley Center for Solid and Hazardous Waste Management issued a research grant to FAU Lab.EES to continue to to develop a list of engineering management alternatives for controlling the release of elevated levels of iron in the aquifer beneath landfills. The objective of the research is to investigate the key parameters governing reductive dissolution of iron and to conduct laboratory experiments on methods such as groundwater circulation well technology for iron removal from groundwater and soils at landfill impacted sites. In 2011, the Bill Hinkley Center for Solid and Hazardous Waste Management issued a research grant to FAU Lab.EES to continue to develop advanced oxidation processes for detoxification of landfill leachate. Previous work funded by the Center has led to the development of reactor prototypes for pilot scale testing. The objective of the proposed research is to test the prototype reactors at pilot scale for the removal of COD/BOD, ammonia, heavy metals, color, and pathogens. In 2010, the Bill Hinkley Center for Solid and Hazardous Waste Management issued a research grant to FAU Lab.EES to develop a list of engineering management alternatives for controlling the release of elevated levels of iron in the aquifer beneath landfills. The objective is to investigate the key parameters governing reductive dissolution of iron and to conduct laboratory experiments on methods for iron removal from groundwater at landfill impacted sites. In 2009, the Bill Hinkley Center for Solid and Hazardous Waste Management issued a research grant to FAU Lab.EES to develop pilot scale onsite treatment systems capable of detoxifying leachate with the power of ultraviolet light and advanced oxidation. The objective of the proposed research is to test photooxidative processes at pilot scale for the removal of COD/BOD, ammonia, heavy metals, color, and pathogens. In 2008, the Bill Hinkley Center for Solid and Hazardous Waste Management issued a research grant to FAU Lab.EES to develop a web-based, internet-accessible municipal solid waste leachate management decision support tool for utilities, consultants, and regulators of landfill leachate in Florida. Enhancing access to vital information on leachate management strategies and applications. To identify viable options for leachate management and rank them according to sustainability, performance, risk, and cost criteria. The assessment will not be limited to current practices. Futuristic technologies, such as plasma arc or photocatalytic oxidation using iron-mediated aeration or TiO2-coated magnetite (under development at FAU), must also be evaluated to forecast which alternatives will be employed by the solid waste community in the years to come. To develop an interactive, web-based decision support tool to aid solid waste managers in long-term decision-making. In 2005, the Florida Center for Solid and Hazardous Waste Management issued a research grant to FAU Lab-EES to investigate treatment options for long-term management of landfill leachate in Florida. This research will address a major technological need for sustainable, economical options for routine leachate treatment and safe discharge to the environment by investigating energized processes, such as photochemical oxidation, which includes the futuristic photochemical iron-mediated aeration (PIMA) and TiO2-magnetite photocatalysis. To examine the literature on energized alternatives for management of leachate; collect leachate quality data; identify issues/trends associated with long-term leachate management; and prepare a list of energized alternatives ranked according to environmental sustainability, efficiency, risk, and economic factors. To design and test laboratory reactors for leachate treatment using energized options such as the photochemical iron-mediated aeration technology (PIMA) and TiO2-magnetite photocatalytic processes. To prepare preliminary cost analyses and risk assessments on selected technologies to provide a Florida-specific matrix of engineering alternatives that are innovative, economical, and environmentally sound to aid solid waste management personnel in decision-making. To view more pictures of the research click here. "PHOTOCHEMICAL IRON-MEDIATED TREATMENT OF LANDFILL LEACHATE"
The goal of this project is to address the lack of viable and sustainable engineering alternatives for handling leachate. One such futuristic technology is called Photochemical Iron Mediated Aeration (PIMA). 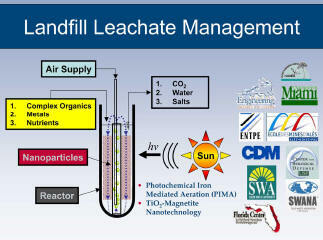 The goal of this project is to begin development of TiO2-magnetite photocatalysis for treatment of landfill leachate. Tests were conducted using simulated leachates and monitoring the removal kinetics of various organic constituents (COD).